Synopsis: “Imprisoned in the heart of a secret military base, Em has nothing except the voice of the boy in the cell next door and the list of instructions she finds taped inside the drain. Time-travel is often a pretty hard concept to grasp if you’re not studying within the field of science. And even then, people think of it as an impossible concept to wrap their mind around as there remains endless paradoxes and loop-holes that appear. If anyone has seen the movie Looper, starring Joseph Gordon-Levitt and Bruce Willis, you may have noticed how the ending left a never-ending series of ‘wtf’ moments because it just doesn’t make sense or add up. Fortunately, Cristin Terrill’s All Our Yesterdays explained her version of time travel in an easy to understand manner, where certain paradoxes would not appear as certain events in time are considered ‘fixed’. The book opens up with Em, who’s imprisoned in the heart of a military base with a wall separating her and her friend Finn next door. We learn that they’ve been caught and are being held there by someone called ‘the doctor’, who tortures them for information regarding hidden documents. This doctor was the person who invented Cassandra, the time machine that started the whole predicament Em, and her 14 previous versions of herself, finds herself in. As this fast paced story progresses, Em figures out a way to open the drain in her cell, where she finds a list of instructions she’s never seen before, written in her own handwriting, detailing each failed attempt to stop Cassandra from being built. The final instruction on the list is pretty clear: She has to kill the creator. The story alternates in POV between Em and Marina, a teenage girl that is in love with her best friend, James. Before you scoff and go, “Why do I have to read about this love-struck teenager when Em is clearly more interesting, and actually has a purpose?”, then stop right there. Terrill didn’t just decide to add in a bit of fluff to balance out her novel – everything in this story has its purpose and you soon come to learn that Marina is not just some forgettable side character in this story. She is literally in a race against time to save her best friend from being killed, and to uncover the truth of of why James’ brother Nate was shot. Marina and Em are both strong characters. Terrill paints them with distinct voices and personalities that define them and allows them to stand on their own two feet. While Marina was definitely fragile at the beginning of the novel, we see her transform into a strong character whose purpose is not longer defined by her feelings for James. I grew to love her, and my heart ached for everything she went through. While I’d love to talk about Finn, I don’t think I can without giving some plot points away. While I saw most of the big plot-twists in the story coming, I still enjoyed the way Terrill executed them. It’s definitely a good surprise to see such great writing and story-telling coming from a debut author. 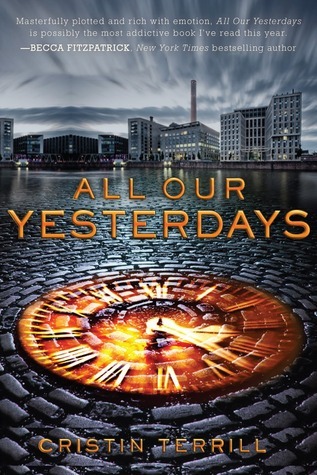 All Our Yesterdays was a fast-paced roller-coaster ride of a story (just the way I like it!) with a wonderful cast of characters. I’m not embarrassed to admit that I sobbed into my pillow during the final chapters of the book. This novel kept me up till the wee hours of the morning because I found it extremely hard to put it down. However, the final chapters of the book threw me off guard, and while I’ve read it over a few times, I’m still a little confused. But as I type this right now, I think I understand the ending a little more as I remember that certain events in time are ‘fixed’. (Let me know if I’m completely interpreting this wrong though!) It certainly is nice to know that someone does get a happy ending. Deep from the back of my mind, a voice that sounds a lot like my own speaks to me like a memory, telling me I’m strong and loved and that everything is going to be okay. And, for some strange reason, I believe it. All Our Yesterdays is the first book in a duology (two book series). I CANNOT wait until the next one comes out, but I wonder what Terrill will write about? I received a copy from Disney-Hyperion and Bloomsbury Australia in exchange for an honest review. Follow the hype for All Our Yesterdays by entering to win an ARC (UK & Aust version) of the book! This is open internationally, so for everyone living outside of Australia who has to wait till September, this is your chance to get your hands on this wonderful book early! The winner will be posted next week in my interview with the wonderful author behind this amazing book. So make sure you come back and check it out!